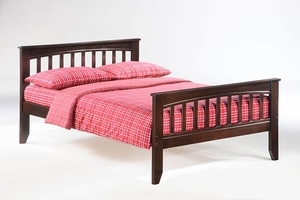 This item includes the Sasparilla Platform Bed frame only, a mattress is not included. This frame is available as a twin and full size in a cherry, chocolate or white finish. If you are looking for a mattress, please see our Platform Bed Mattress section for premium quality mattresses. The Sasparilla Platform Bed Frame is manufactured using high quality solid hardwoods, and is perfect for everyday use. It features a premium multi-step stain and lacquer process to create a superior finish. This Platform bed comes complete with the slat kit and center support rail (except twin) for your mattress to sit on. IMPORTANT NOTICE: Assembly Required. This frame is sold without a mattress, to order your mattress please see our Mattress category. The Sasparilla bed can be shipped via UPS Ground or LTL Freight*. Most orders ship out within two business days. Please place the item(s) into your cart, then enter your state and zip code and click on the "apply" button. The shipping cost will be added to your total. Deliveries made to rural and remote areas may be delayed and/or incur additional delivery charges. If you live in a remote, rural or otherwise unaccessable area, please check with us before placing your order. *If you choose Freight shipping, the following conditions apply: The freight carrier will contact you to make a delivery appointment. Residential LTL deliveries are "Curbside Delivery" and include a lift gate on the back of the truck to allow heavy items to be unloded at ground level. You are required to meet the delivery truck in front of the house, the driver will unload the item(s), but the customer is responsible for carrying item(s) into the house. Please arrange for help to bring heavy items inside. It�s possible you may be able to arrange additional delivery services with your carrier, for an additional charge, at the time they contact you to set the date and time. IMPORTANT: On arrival, inspect the shipment immediately for obvious signs of damage and note any damage on the Bill Of Lading before signing. The manufacturer warranties this product to be free of defects for a period of 5 years. In most cases, they will simply ship you a new part, however they may either repair or replace the defective parts at their discretion. The manufacturer will pay the shipping to send any covered warranty repairs or replacement parts to you.